The September 22 evening debate on LRT television focused on the fate of higher education institutions, drawing expatriates back, ways to curb increasing alcoholism and how to increase incomes in regions. The previous debate was received critically by experts, with preparedness being rated at a very low minus five points, improvement was palpable this time, albeit still not perfect. Alfa.lt reported. 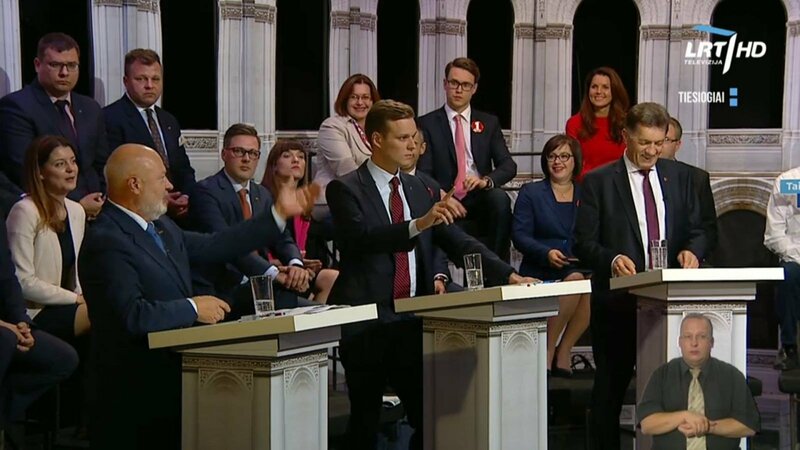 The parties participating in the debate were the Labour Party (DP), Lithuanian Peasant and Greens Union (LVŽS), Homeland Union – Lithuanian Christian Democrats (TS-LKD), Lithuanian Republic Liberal Movement (LS) and the Lithuanian Social Democrat Party (LSDP). “Some parties spoke in more detail, some spoke less, but focused on specific ideas. Compared to the previous debate, these went smoother, there was an effort to rely on financial data. This was done rather successfully,” pointed out Vytautas Magnus University (VDU) lecturer, political scientist Giedrius Česnakas. He was surprised by the Homeland Union’s choice to express some unpopular opinions, such as that of needing only three universities in Lithuania. With calls to close the Lithuanian University of Educology and either close or merge VDU, they could lose votes, but this is a demonstration of courage other parties lacked. Overall Česnakas noted more focus on recommendations and suggestions, instead of looking at reasons for problems, which he found to be a positive change. He still observed responses that seemed to veer off course, but there was structure this time, specific examples were given. Another political scientist from VDU Ingrida Unikaitė-Jankuntavičienė was more surprised by the lack of participation by Liberal Movement representative Eugenijus Gentvilas. She noted that the party response to higher education was muddled and off-track, suggesting a lack of preparation. The politics lecturer at VDU found the Liberal Movement to have performed weakly. 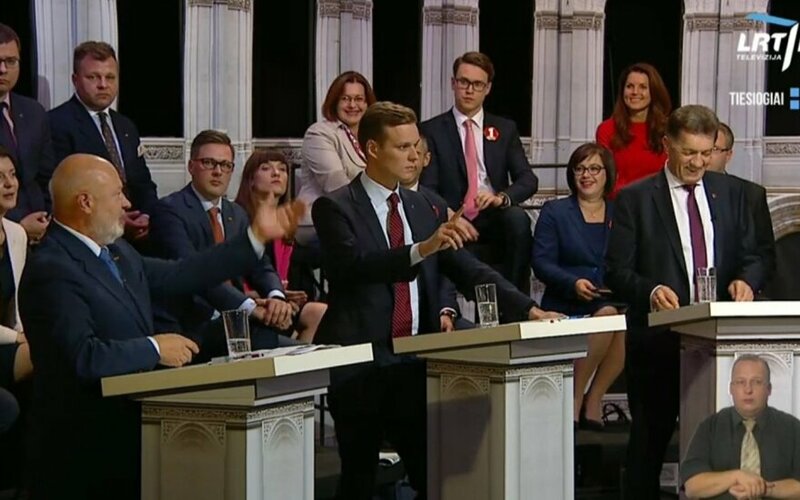 The previous debate was marked by clashes between Conservative leader Gabrielius Landsbergis and Social Democrat leader, current PM, Algirdas Butkevičius, with much digging into the achievements and failures of the current term. This debate was marked by a lack of major clashes, but digging into the past continued. “The Social Democrats praised what had been done as usual, while the opposition, naturally, criticised them. A. Butkevičius’ party mostly returned fire and endeavoured to show that their policy has been beneficial to the development of the state, the PM focused on improving metrics,” noted Česnakas, albeit pointing out a lack of charisma in the PM, something that tables cannot make up for, furthermore adding that the statistics displayed were very selective and failed to show the entire context. Unikaitė-Jakuntavičienė found that parties responded very differently, depending on the question posed. Sometimes they would answer very well, sometimes the answers would fall short. She noted that Landsbergis was less aggressive during this debate, making it easier to follow his discussions with Butkevičius. Meanwhile Vytautas Gapšys, debuting in the debates for the Labour Party looked to be the more aggressive party this time round. This observation is echoed by Česnakas, who noted that Gapšys insisted on LVŽS frontrunner Skvernelis answering whether he supports gay marriage, in an effort to show the traditionally concervative voters of the “Peasants” that their party is not that traditional, perhaps drawing some of the LVŽS voters to the DP. Some of the points found in electoral programmes amuse even the candidates themselves observed Česnakas. One such feature is the minimal wage, with politicians joking about who would have the highest bid. The expert stressed that this makes for an impression that they are not taking it seriously or find the raising of the minimal wages as an instrument to lure in voters. He also noted that the “Peasants” showcased some ideas that have already been essentially fulfilled. The political scientist found an episode in the discussion of rampant alcoholism with Simonas Gentvilas of the Liberal Movement particularly odd, where politician suggested Lithuanians should be taught to drink wine. I. Unikaitė-Jakintavičienė was not impressed either, noting that weaker drinks cause just as much trouble and that the limited time in the debate is better used on statements and ideas, rather than personal experiences or stories about trips to Spain. G. Česnakas also noted a brief moment where G. Landsbergis lambasted S. Gentvilas, asking if he was a member of the family or a relative to Eugenijus Gentvilas, something that was countered by the moderator, pointing out Landsbergis’ own heritage. Česnakas notes that Landsbergis sometimes still shows too much aggression. Political scientist Unikaitė-Jakuntavičienė saw Butkevičius, Landsbergis and Skvernelis as the strongest performers of the night. Worst performance, same as last week, went to Eugenijus Gentvilas. She gave the debate a mediocre score, a five, noting that the top performers still lack polish. According to the expert they still have to focus more on ideas and offers, spend less time criticising others and digging into the past. Unikaitė-Jakuntavičienė found pointless arguments to be the biggest flaw in the debate, with politicians arguing just for the sake of arguing or causing a reaction. That said she found the debate calmer, albeit lacking a large qualitative leap forward. Česnakas found that candidates lack ability in improvising, with many simply reading their statements. This is particularly applicable to S. Skvernelis who spends too much time staring at his tablet, trying to find information. The expert mused that this could be due to a lack of confidence, with the politician struggling to be in the limelight.